Imago is bringing back to Portland its globe-trotting production ZooZoo this holiday season. Bugeyes, hippos with insomnia, arrogant anteaters, introverted frogs, paradoxical polar bears, acrobatic worms, self-touting accordions and tricky penguins fill the stage with wonder, awe and humor. ZooZo has toured internationally since 2009 following on the heels of Imago’s signature work FROGZ. For those that want to see Imago’s ZooZoo before it closes, be sure to catch it this coming holiday season before those critters are packed off to company storage (Imago’s warehouse museum of fascinating creatures.)! "Very special treat … fun ... completely enthralled!" "Magic and spectacle … amazed and enchanted … thrilling … hysterical … a supremely theatrical spectacle … completely immersing … the most purely gratifying moments of theatre I have seen!" 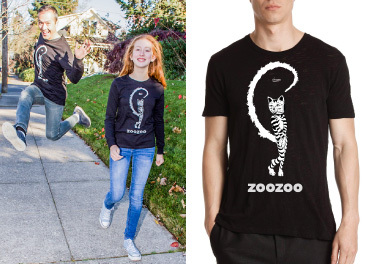 2018 ZooZoo t-shirts will be available at the show! Please call 503.231.9581 for more information or to purchase.